"The story takes place in a familiar Burtonesque world of characters with balloon heads, saucer eyes and pretzel limbs. Seeing them in b&w only underlines their grotesquerie, and indeed the whole story benefits from the absence of color, because this is a stark world without many soothing tones. Burton uses a stop-motion animation method employing puppets, and I learn from Variety that he employed 'about 33 animators working to produce five seconds of film per week apiece.' Amazing that such a lively film took such laborious piecework. "This isn't one of Burton's best, but it has zealous energy. It might have been too macabre for kids in past, but kids these days, they've seen it all, and the charm of a boy and his dog retains its appeal. I only hope that young Victor doesn't let Sparky lie out in the sun for too long." 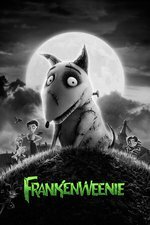 "The delights of 'Frankenweenie' are abundant and real. Its opening scenes are beguiling in their strangeness, and its climax is wild and hilarious. But the movie, a Walt Disney release, also feels tame and compromised, a tissue of safe pop-culture allusions rather than an inspired, audacious engagement with older movies." Frankenweenie was also a live-action film of Burton's from 1984. Victor Frankenstien: Nobody likes scientists. Mr. Rzykruski: They like what science gives them, but not the questions, no. Not the questions that science asks. This film couldn't be any more Tim Burtony if it tried; I'm wondering if folks didn't take to it because it had some dark elements? I enjoyed it, although it did seem a bit less ground-breaking than Nightmare Before Christmas. I didn't know know about the fan theory (under "Trivia" section) prior to researching for this post, so I found that a neat idea. What did you all think?